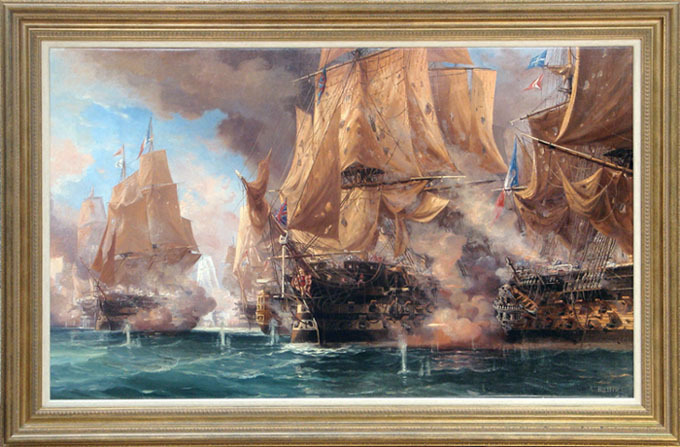 Four separate oil paintings on canvas all dated 1875 and showing four phases of the great sea battle off Cape Trafalgar in October 1805. Now published as a series of limited edition prints, both on paper and on canvas. Auguste Ballin was born in Boulogne in 1842. He was a pupil of Jules-Achille Noel. After the Franco-Prussian War he left France and settled in Brentford, London. 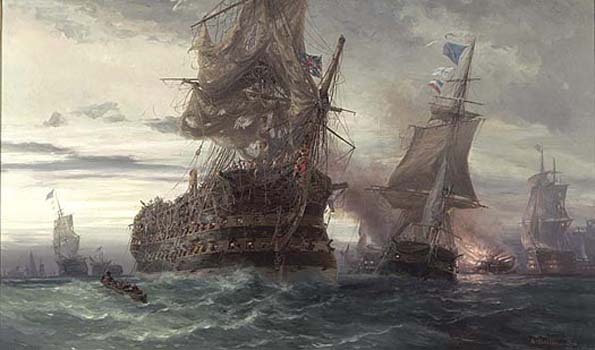 He exhibited historical subjects - including the magnificent Trafalgar series - at the Royal Academy and the Royal Society of Painters between 1872 and 1897. Although it had been known for some time that a London club and a Portsmouth club each had a pair of these 4 paintings, there had been no successful effort until summer 2004 to try and re-unite them. With both clubs keen to authorise the copying of their pictures so that the dream of unification could be achieved, the result is that all four paintings are now available either as separate images at different sizes (on canvas and paper) or together as a montage of the four (on paper).